I have used both the Wood Pizza Peels and the Metal Pizza Peels in the restaurant industry for the last 30 years. In this article, we will be talking about Pizza Peels – Wood vs Metal. [The wood pizza paddle absorbs the oils much better.] This allows you to serve your pizza without all of the grease and oils on the bottom of it. 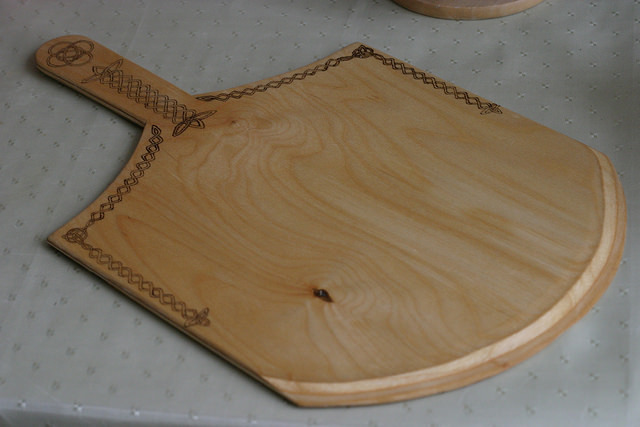 [The wood pizza paddle is a much better-looking pizza utensil.] When you have an open kitchen style like we do. You need to think about how pleasing your kitchen looks. This includes all of your kitchen utensils. [The wood pizza peel is much easier to grip.] With the wide handle that the wood pizza peel has it is much easier to hold than the round handled pizza peels. [No pizza screen needed for a wooden peel] With wooden pizza peels, you generally lay the pizza dough directly on the peel. This eliminates the need for pizza screens. [Wooden pizza peels are very heavy.] This will affect the stamina of the oven man. If he is wielding a large heavy wood pizza paddles all night. He is more likely to fatigue at a faster pace than if he had a lighter metal pizza paddle. [Wooden pizza peels are more expensive than metal pizza peels.] Take into consideration that you might not go through as many wooden pizza paddles throughout the year. So it might be worth looking deeper into this metric. [Wooden pizza peels are very thick.] This makes them hard to use with some types of pizza ovens and pizza cooking methods. Make sure to take into consideration how you are cooking your pizzas. 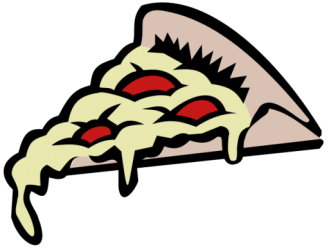 [Removing a pizza from the oven is harder with a wooden paddle] The head of the wooden peel is very thick so it is hard to get the wooden paddle underneath a cooked pizza. [The metal pizza peels are much lighter than wood pizza peels.] 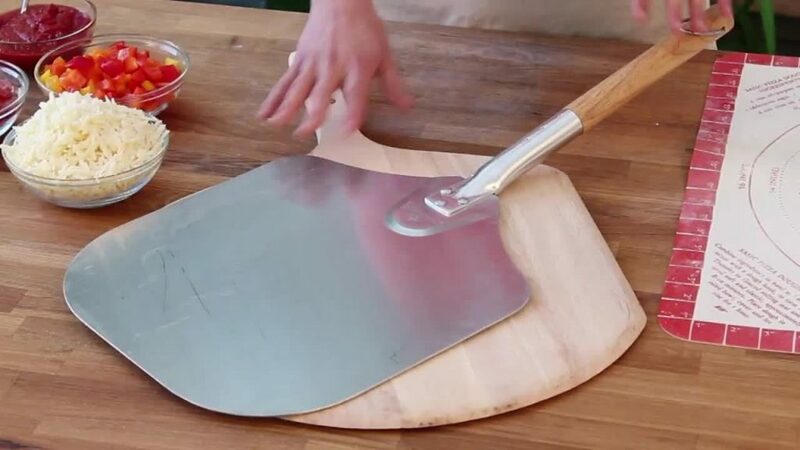 Metal pizza paddles are actually made of aluminum. This makes them very light which will make the oven guy happier. [Metal pizza paddles are generally much thinner.] A thinner metal pizza peel means the oven man can slide the pizza peel under the pizza much easier than a wooden pizza paddle. [Metal pizza peels are much cheaper than a wooden pizza peel.] This is strictly a cost factor, but an important factor anyway. This should not be the main factor but it does deserve consideration. 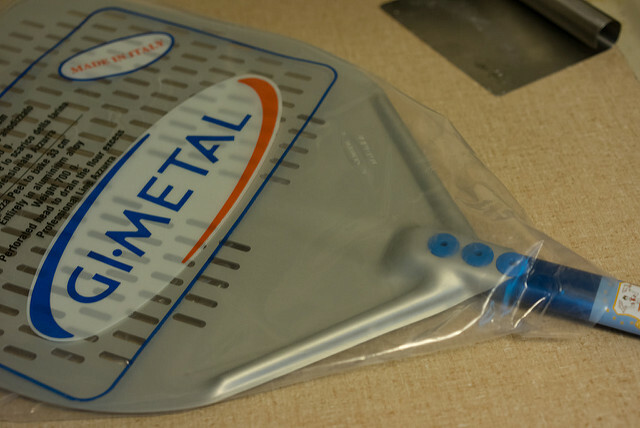 [The metal peels come in a lot of different lengths and head sizes] There are just more options when it comes to pizza paddle when you are looking for a metal peel. [Metal pizza peels do not soak up the oils and grease.] This means that when you place your pizza on top of the metal pizza peel. All of that grease gets on the bottom of the pizza and makes it greasy. [Metal pizza peels bend and break easier than wooden pizza peels.] Because metal pizza peels are thinner and lighter. They are also weaker and easier to break. 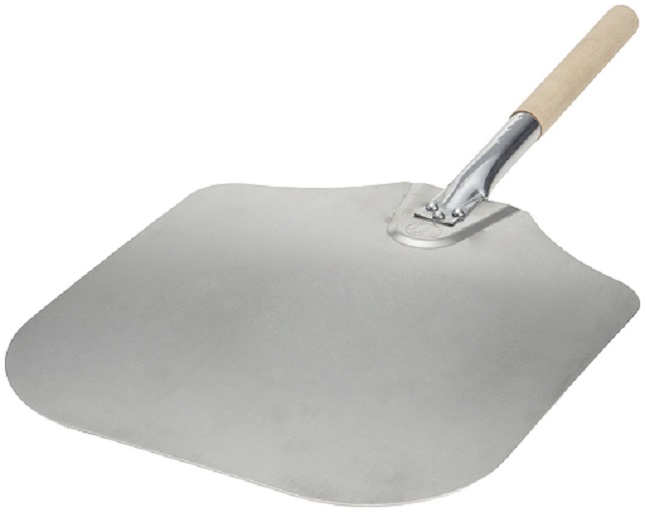 [These pizza peels are very slippery] It gets pretty difficult to grip these pizza paddles with aluminum handles. As you can imagine the handle will not soak anything up. [The handles on these peels feel very thin] The handles are thin and slippery so the peel never really feels secure in my hands. For this reason alone I don’t like the all aluminum pizza peel. The peel we use is a hybrid of both peels. [The handle allows you to keep your grip in all conditions] The handle is wooden on this peel, it is very absorbent and soaks up all the greases. This way your pizza man keeps a good grip at all times. [There are a lot of different options for this peel] This pizza peel comes in a lot of different sizes. You can get the aluminum head wide or slim and you can get the wood handle very long or very short. [The hybrid peel is very inexpensive] The hybrid pizza peel is actually very inexpensive compared to the wooden peels out there. Even the all-aluminum peels tend to be a little more expensive than these paddles. [Easy cleanup] The cleanup on this is very easy. We just bring it to the dish room and scrub it with soap and water, rinse and you’re done. Give it a few good spins just to make sure its dry. [Metal pizza peels need to be filed down to work with some ovens.] You have to manually file down the edges of a metal pizza peel for it to work with pizzas on top of pizza screens. [There are too many options] Sometimes it’s possible to have too many options and this is one of them. There are so many different sizes, lengths, and thickness. You need to do your homework so you don’t waste your money. Remember these are just Pros and Cons of the pizza paddles wood vs metal. All of the information above is to be taken into consideration along with all of the other variables that come with different restaurants. When choosing Wood vs Metal pizza paddles. You must take into consideration things like Type of oven to be used, the method of pizza cooking, budget, and your experiences that you have had over the years. Also, remember that there are a lot of different choices pizza paddles wood vs metal. I can think of 4-5 different metal pizza peels I have used over my course of making pizza. I have also used 2-3 wooden pizza peels over that time. So if wooden pizza peels fit your restaurant but you did not like the first wooden pizza peel you bought. I would recommend trying at least 1 more different type of wooden pizza peel before giving up on the wood pizza paddles for good. The same goes for metal pizza peels. There are a lot of different types of metal pizza peels. So do not give up before trying a different variation of the metal pizza paddle before throwing in the towel. I hope this helped you in your quest for the perfect pizza peel. You can always check out my Pizza paddle Review page other blog posts that I have posted. Thanks and good luck! 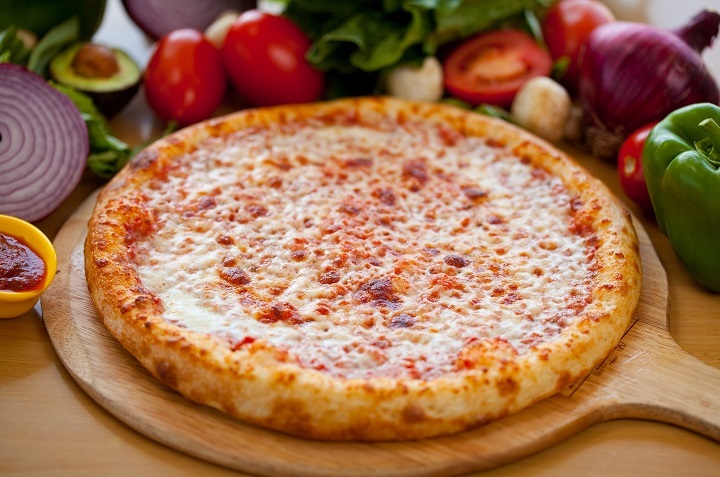 Check out our homepage for more information about everything pizza.